After detailing our thoughts on the best and worst aspects of the second season of Orange Is the New Black, we realized that there’s just too much craziness going on at the Litch for one article. The season is chock-full of great moments, but also a few regrettable ones. We’ve decided to compile another list of the best and worst aspects of Orange Is the New Black’s second season. Nasty casual racism aside, Morello was a interesting background player in Season 1, but the revelation about the true nature of her engagement with Christopher was remarkably executed. We’ve been hearing Lorna drone on about wedding plans and a perfect fiancé since the first episode, but to learn that they were really the delusions of a profoundly delusional woman was one of the show’s finest Season 2 shockers. Yet more proof that you never really know someone, the outwardly pious sister Ingalls was revealed to be a fame-hungry rock star wannabe who saw herself as the Bono of charity work (so, basically just Bono). It was an interesting curveball for the character, but it doesn’t quite line up with everything we gleaned about her from last season. Who knew the mostly silent cancer-stricken inmate would become such an endearing character in Season 2? Orange Is the New Black excels at adding dimension to characters who could have easily been written off as one-note background figures. Rosa’s character, with her pessimistic snark and heartbreaking storyline, became a huge highlight of Season 2. While so many characters got beefier roles in Season 2, inmates Maritza Ramos and Marisol Gonzales weren’t given the same upgrade. There was the short subplot where the duo blackmailed Bennett into sneaking contraband into the prison via his leg, but they didn’t have much to do beyond that. We really want to learn why Gonzales has such an unhealthy fascination with The Smiths. After terrorizing the Litch for a full season, it looked like Vee might slip away in the wind, but good ol’ Rosa, patron saint of manners, made sure Vee received the ultimate lesson in etiquette. “So rude, that one!” Vehicular manslaughter has never felt so cathartic. There’s a pendulum of feelings regarding the death of Vee swinging in our minds right now. Carnal satisfaction is bumping up against proper storytelling logic, and as nice as it was to see Vee get exactly what was coming to her, it did leave a slightly sour taste in our mouths behind all that sweetness. Vee hit Litchfield like a tempest, but there doesn’t seem to be much debris in her wake. We worry that Rosa mulling down Vee with the prison van hit a factory reset on the show, and everything will now, more or less, go back to normal. It feels like too tidy of an ending for such a great storyline. At least Caputo is experiencing the biggest headache of his life. 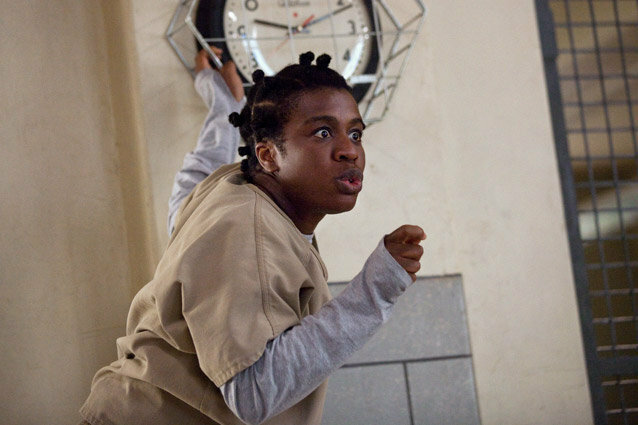 The best flashbacks on Orange Is the New Black help to shed light on the characters’ current situations in prison, and perhaps our favorite one of the season was Crazy Eyes’. We thought that the visual gag of Crazy Eyes’ posh white parents from season one was a one-off joke, but the series followed up on it, delivering a great glimpse at why Crazy Eyes has such a craving for affection, and why it’s so easy for Vee to wrap Suzanne around her little finger. Despite her truckloads of sarcasm, Nicky still has some dangerous demons swirling around inside. Seeing the character struggle with her heroin addiction yet again was a great callback to Season 1. Now that the character is sitting on a truckload of the drug thanks to Vee, it will be interesting to see if she can maintain her sobriety in Season 2. Sure, fans went into a series of convulsions when they heard that Laura Prepon would only be appearing in a few scant episodes of Season 2, but the character’s disappearance from the Litch led the way for some interesting things story-wise, especially with regards to Piper. Thus, the way Alex is presumably returning for Season 2 feels a bit contrived. It was just too easy for Piper to manipulate Alex back into prison. A drawback to watching every episode of Season 2 in one mad binge is that we all have to wait for an entire year for more. It’s going to be a long, long year spent refreshing Netflix on our browsers.